You Will Never Want to Use a Cash Dispenser Again! ..Maybe. 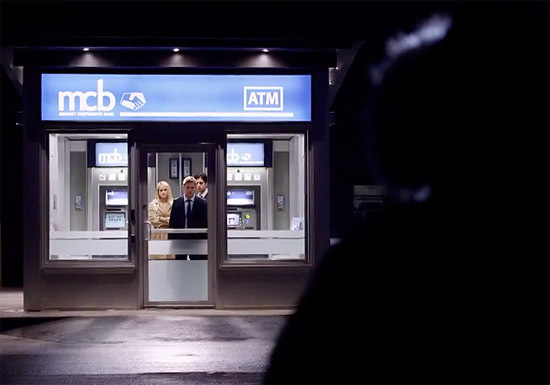 The Trailer for 'ATM' is Here! A trailer has been released for director David Brooks' debut contained thriller ATM. The thriller centers on three co-workers Josh Peck, Alice Eve, & Brian Geraghty who make an unfortunate trip at night to pick up some cash from an ATM vestibule but become trapped when a murderous psychopath threatens to murder them. Screenwriter Chris Sparling has already penned a single-location thriller with Buried. Hit the jump to check out the trailer. ATM will be released later this year. I'm reading: You Will Never Want to Use a Cash Dispenser Again! ..Maybe. The Trailer for 'ATM' is Here!Tweet this!